Going home from work one night, my beloved and I waited at a traffic light. It went green, as traffic lights do, if they’re in working order. Not only did that light turn green-all the lights as far as the eye could see did as well. Smooth sailing home. So, in the ugly photograph, the lights are all green. The only problem with copying the photograph, is that is, as I have said, ugly. So, how am I to keep the optimistic metaphor, while making the drawing something be enjoyed? So, I scribbled and experimented. 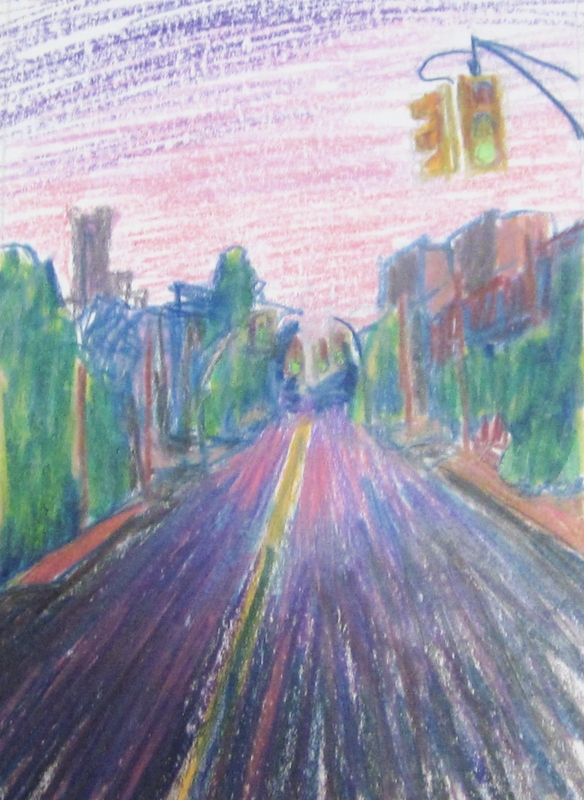 As I did it, the street started to look like it came out of Munch’s “The Scream”. Not quite the intention I had. So, I smoothed it out, added reflections…and got something that looked a bit as if it just rained. So, here’s the sketch for “After the Rain”. The large finished work will be tighter…but right now, it has the look to a failing assignment in “Perspective 101”.